Sometimes English can be quite frustrating, one letter can completely change the meaning of a word and the way the word is used. One confusing pair that unites tricky words is sometimes and sometime. This is easy to distinguish not only in spelling of these words but also in the meaning and usages. 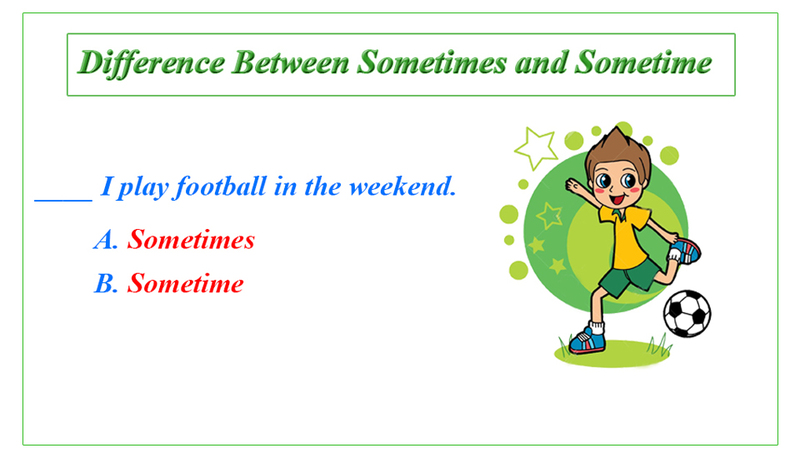 In this lesson we will learn about the difference between sometimes and sometime. When we do something on certain occasions, instead of all the time, but not all the time we use sometimes rather than sometime. Sometimes I go by car. Sometimes I go to a movie. Sometimes I go shopping in the middle of the week. I don’t do it all the time, I do it sometimes. Sometimes I pick up dinner from a Pakistani restaurant. He sometimes writes to me. This means that I don’t think that or do that all the time, but only on certain occasions. So there’s certainty here. I know when I do these things and when I think these things. Sometime is used to describe something that happens at an unknown time in the past or the future, or at a time that you do not know exactly. I saw him sometime last summer. (You don’t know exactly when, but you know that you saw him last summer). I would like to visit Islamabad sometime next year. (I don’t know when exactly I would visit). We must get together sometime. I hope this lesson has made a little bit easier for you how to use sometimes and sometime correctly. If you have any question, please feel free to write to us in the comment box below.